Outstanding IMAX Midnight 'Skyfall' Poster - But Will It Be Full-Size? Let me say first that I absolutely love this poster. I want it. On my wall right now, staring me down every night. It's stunning and fits Skyfall (one of the best Bonds in a long time) perfectly. But I'm afraid IMAX is going to bait and switch midnight fans once again. Following up regarding my complaint about the "IMAX exclusives" and the very cheap tricks they pull just to build interest, this is a poster I would go out of my way to get. But if I go to a midnight IMAX showing of Skyfall in a few weeks - will I even find it? Or be given a full (27"x40") poster? IMAX sneakily doesn't include any size or details in their announcement, just a look at this poster and that's it. That's all we have, unfortunately. But it's definitely worth taking a closer look at! Note: These are being given out at 12:01AM Midnight showings of Skyfall, opening in IMAX (upscaled via DMR) one day early, starting Thursday, November 8th in a few weeks. I wish these were full-size prints! Skyfall is being directed by Sam Mendes (American Beauty, Road to Perdition, Jarhead, Revolutionary Road, Away We Go), from a script by John Logan, Neal Purvis and Robert Wade. Skyfall will once again star Daniel Craig as James Bond 007, along with Javier Bardem, Dame Judi Dench as M, Ralph Fiennes, Albert Finney, Naomie Harris, Bérénice Marlohe, Helen McCrory, Ola Rapace with Ben Whishaw. You can also follow the official twitter @007 for updates as well, they've been tweeting photos and more. 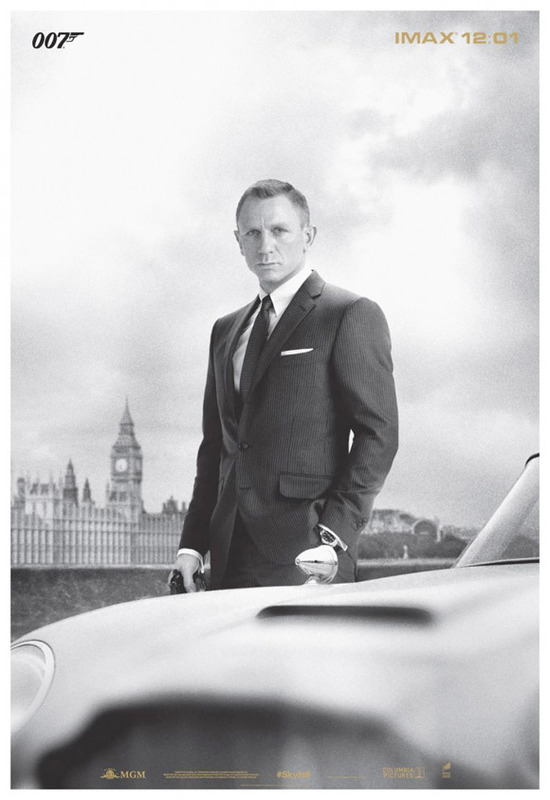 Columbia Pictures, Eon Productions and MGM have Skyfall set to hit US theaters on November 9th this fall. We'll continue to keep you updated on all things Bond. Check out my on set experience in Istanbul. Almost time! Skyfall will also open in IMAX theaters starting Thursday, November 8th one day before the regular release. I'm confused. How is it that you love this poster, but absolutely hated that Lincoln one? I'm not saying I dislike this one, but ultimately it's just a photo of him staring intently with the London skyline in that background. What in particular speaks to you so much? ^^What HB said above. Exactly. This has a good background, it captures both old Bond (the car) and new (Daniel Craig) and has so much more depth, it has layers to it. It's beautiful. Lincoln was, as HB says "extremely bland." I saw it more as a fantastic recreation of the iconic penny portrait of Lincoln, but to each their own I guess. That being said, I still like this poster a lot. Sorry, accidentally posted 2 responses...thought the first had not saved. I just felt as though they had such potential to create a great Lincoln poster so it just fell flat. I love the idea of posters that are simple portraits, especially for biopics. Also related, at least personally, I'm more likely to keep a poster and hang it if it's an 11x17 vs a larger format, that is at least if it's a quality print. It's completely personal preference though because I just like the idea of being able to showcase posters for a lot of movies that I like vs. only a few, getting a good grid of framed prints to cover a wall. Right, it's the art of collection, but everyone is different. It's a money-saving tactic, they're not thinking about customers when they should be. They're figuring out how to get you in, then give you the cheapest of what they can actually offer. IMAX should be better. They never give out full-size posters. They just don't. I don't see why you keep expecting them to. That said, this would be an amazing full size print lol. It's gorgeous. I have the Casino Royale poster in my room, the one where he's got a gun at the poker table. My favorite poster of all time. "This would be an amazing full size print" THAT is why I keep fighting for this. Because I believe in QUALITY and a care/concern for customers, especially the ones who go out and spend money, not cheap marketing tricks. But they aren't tricks, they aren't trying to fool anyone. They don't have to give us anything at all. Now, if we had to pay for this poster without knowing what we were getting, then, yeah, it's a trick. But as is, it's just a nice bonus. It's a trick because 27x40 posters are the regular, commonly known "poster". They trick you by hiding the size or any details about it in the announcement. The image online makes it seem fullsize (notice how small the logos are?) but then they print off cheap minis and give them out to save money. It's a sad, deceptive trick. Of course they don't have to give out anything, but it's a bait and switch that they're covering up by just not including all the proper info. They SHOULD be giving out fullsize, like we used to do ourselves for years, and not skimping just to save some money. Don't you want a REAL poster? I always contact the programming coordinator at my local theater for this type of information. Just find out who it is and fire off an email or give them a call. "I want it. On my wall right now, staring me down every night." Creepy.